In Sakai, the knives are a cut above. KS meets the men whose handiwork helps world-class chefs earn their stars. Those knives were made from a batch of steel so fine it is almost legendary, but what makes them truly venerable is that these tools were fashioned by the traditional methods of Sakai, a city that was once the seat of kings. Many clues to the history of royalty there remain hidden within keyhole-shaped burial mounds dating back to the third century AD. Building those mounds, however, did require iron tools, and that is where the story of metal craftsmanship in Sakai begins. Traditional Japanese cuisine uses lots of vegetables and fish. The usuba, a long, rectangular blade, is meant for vegetables. The deba, with a gently curved blade and back that meet in a pointed tip, is ideal for fish. The yanagiba is a long, narrow, tapering blade made for slicing filleted fish in a single draw, letting the knife do the work. The more modern gyuto has almost the same silhouette as a French chef’s knife and is meant for cutting meat. The santoku, designed for versatility, is good for slicing, dicing, and chopping, and would be the best choice for an all-around kitchen knife. A variety of shapes are made for very specific tasks, as well, such as the sushikiri for cutting rolled sushi and the unagisaki for filleting eel. As regal power waned and military power grew in ancient Japan, Sakai became a major supplier of the swords that would not only be the weapons, but also the icon of the samurai class. Official recognition came in the eighteenth century after the Portuguese brought tobacco to the archipelago. Sakai produced knives of such high quality, for cutting the leaves, that the government allowed the blades to be engraved with a Sakai Kiwame (Sakai Exclusive) mark. In 1982 the Ministry of Trade, Economy, and Industry designated Sakai cutlery as a Traditional National Craft, ranking it among Osaka’s other traditional crafts: Naniwa pewterware, transoms, fine cabinetry, Senshu Paulownia chests, Kongo bamboo blinds, and household Buddhist altars. The contemporary stage of this millennial evolution of expertise requires no less than three craftsmen to produce a single, handforged kitchen knife. The blade is first given its composition and shape in the forge. The light is kept low here, so that the bladesmith can see clearly the color of the metal as he works it. He is a metallurgist who spends his days surrounded by a mechanized hammer, a cooling trough, and the hearth, which approaches a temperature of 1500ºC. He uses templates while coaxing high carbon steel into a variety of shapes, driving out impurities, and balancing the different characteristics of the metal, sometimes with nothing more than an anvil and a hand-held hammer. Sparks do sometimes fly, but the work is a meticulous mastery requiring years of apprenticeship. The blade then travels to the grinder’s workshop where it is given its final profile, keen sharpness, and high polish on a series of increasingly finer surfaced wheels. There are no templates here. The arms and hands of the grinder are guided by his knowledge of the materials and decades of experience. Mr. Fujii Keiichi, whose workshop I visited, regularly demonstrates his ability to do this with one hand when he guides schoolchildren through a hands-on introduction. The most traditional Sakai Knives are single beveled (essentially flat on one side with the bottom half of the other side angled to create the edge). This makes for the sharpest possible edge in the cutting tool industry. It also means there are different knives for lefties and righties. Even the most exquisitely worked blade, however, would be of little use without a handle, and the handle will ideally suit the blade and the hand of the cook. The different shapes of Japanese knives are intended for different food preparation tasks. The handles are designed to balance the knife and provide the proper grip for that task. 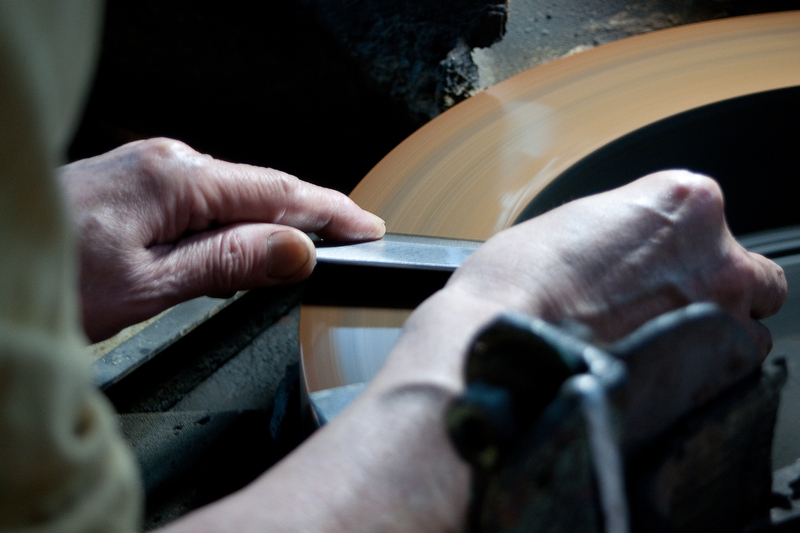 For Sakai knives, the handles are made by hand in yet another workshop. Different woods are turned to a variety of shapes on a lathe. A hole is drilled, then prepared for insertion of the tang with a red hot iron. Each handle is sanded, burnished, and capped with a ring of water buffalo horn, by hand. In this workshop alone, a single handle may result from the work of several different craftsmen. Not all Sakai knives are priced at a small fortune. You can own one of these technological masterpieces for between ¥10,000 and ¥40,000, depending on the size and shape. Even for the average home cook, these knives are a worthy investment because with proper care, they will last a lifetime, and enhance your experiences of cooking and eating. The sharper a knife, the easier and safer it is to use, and the more it preserves the taste and texture of ingredients, even at the microscopic level. Cells that are sliced cleanly, rather than torn or crushed, remain crisp and release less of their self destructive enzymes that begin the process of decay. They retain more of the compounds that give foods their nutritional value and flavor. That is why Sakai knives have gained recognition from chefs worldwide as among the finest and most reliable of kitchen tools. Tower Knives Osaka, 70m east of Tsutenkaku Tower, proudly offers a wide range of Japan-made culinary knives and sharpening stones for professional and home use. Hands-on lessons and workshops in knife use and maintenance available upon appointment.